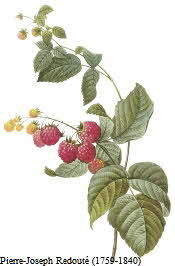 The raspberry plant is a member of the genus Rubus, rose family (Rosaceae). They are composed of many connecting drupelets (individual sections of fruit, each with its own seed) surrounding a central core. Raspberries and blackberries make up the group of plants commonly called brambles. The crowns and roots of brambles are perennial; the thorned canes, or fruiting portions of the plants, however, are biennial, bearing in their second year and then dying. There are more than 200 species of raspberries grown in the world, with red, black and golden varieties. The first American colonists found both black raspberries, or "blackcaps," and red raspberries (the sweeter of the two) growing abundantly. The golden raspberry is plump, fragile, hollow, and gold in color. Martin Van Buren, while campaigning for the presidency in 1840, was said by his opponents to "wallow in raspberries", a shocking extravagance. According to legend, raspberries were originally white. The nymph Ida pricked her finger while picking berries for the crying infant Jupiter, and raspberries have since been tinged red with her blood. (The botanical name of the raspberry is Rubus idaeus. Rubus means 'red', and idaeus means 'belonging to Ida').